The idea of turning the 1st of May into a day of action for workers was first proposed at the 4th congress of the American Federation of Labor (AFL). It was decided to launch, starting from the 1st of May 1886, a wide campaign of agitation and struggle focused on limiting the working week to forty hours. The most radical actions took place in Chicago. 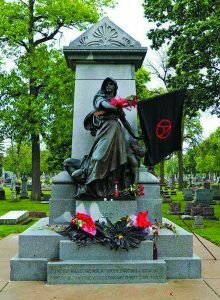 At that time, Chicago had the most developed workers movement in the USA with a strong anarchist presence. Following the 1st of May 1886, strikes were still ongoing as the fight with employers became tougher. On the 4th of May, a meeting gathering around 15,000 people was attacked by police. By the end of the day, both sides had suffered numerous dead and wounded. It was a perfect occasion to muzzle the protest. Eight of the main organisers, all anarchists, were arrested and sentenced to death. The sentence was turned to life imprisonment for three of them. On 11 November 1887, Albert Parsons, Adolphe Fischer, George Engel and August Spies were hanged. Their comrade Louis Lingg committed suicide the day before to avoid execution. A few years later, they were acquitted of all charges and the court admitted that the police and justice system set up the case to criminalise and break down the workers’ movement. The eight accused were declared innocent and the three survivors set free. The 1st of May is definitely a page of workers history stained with anarchist blood. 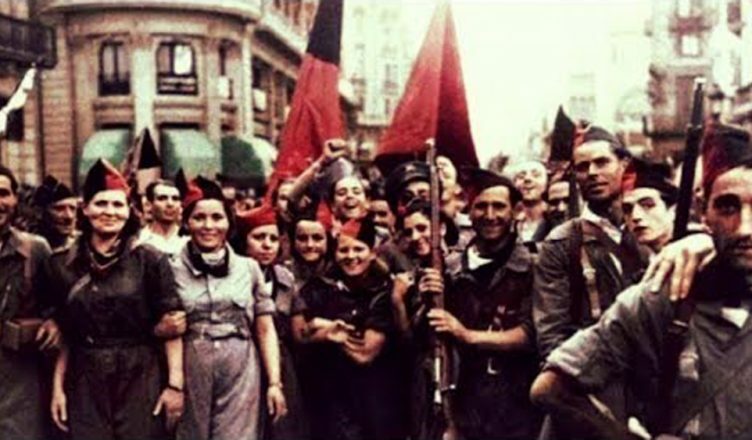 THE 1st OF MAY is an occasion to remind us that the fight against capitalism is still going on. Nowadays in Europe, strikes and social struggles are seriously discredited. Yet, the difference between rich and poor keeps growing, the financial markets are back in the saddle and traders are still handling billions of dollars. Are we wrong to ask for more when half of the world’s wealth is owned by 1% of the population? Meanwhile, workers are asked to make more and more effort to “save” the economy and put the State back on its feet with its batch of new taxes (such as the bedroom tax) and cuts in public services. We are heading toward a neo-liberal capitalist system in which the State’s main purpose is to maintain social control so capitalism can develop without constraint. Workers are producing everything and yet they own very little. This analysis is old and well known but despite it, workers in Europe slowly give up the fight for a fair redistribution and instead just hope that troubles will fall on someone else. In addition, work has been sanctified so that the idea is widespread that if you don’t want to be a good worker that produces and obeys it makes you lazy, a parasite or an idealist (choose yours!). As anarchists, we think that human beings shouldn’t be defined by the surplus value they bring to capitalism. Work should be the way to produce by necessity and not to create new needs. Work must be organized so everyone can work less, and for means other than profitability. No capitalist society will ever achieve full employment because it needs a pool of unemployed people so the necessity to work can make us accept bad working conditions. In order to reorganise work, we need a society free from class and leaders, and in which society is managed in a self-organised way. This is what the Anarchist Communist Group is fighting for. Direct action gets the goods, not waiting for an election in 2020, which just might deliver another Labour government that will continue with business as usual. Jackdaw No. 2 Out Now! Should you consider joining the ACG?